Originally, I wrote all this dialog but didn’t think much about the accompanying artwork at the time. I just figured it’d be a bunch of typical talking heads (or in this case, one talking head). But it ended up being quite a lot of dialog and I really needed a bit more variety in the artwork to keep it from feeling monotonous. I originally had not planned on the two cut-away flashback panels showing the village in its “before” and “after” stages. I also had not planned on the cut-away panel of the yak pen on the previous page. But I needed to break away from Goshen and the hut here and there to keep things visually interesting, and those places seemed to work pretty well. 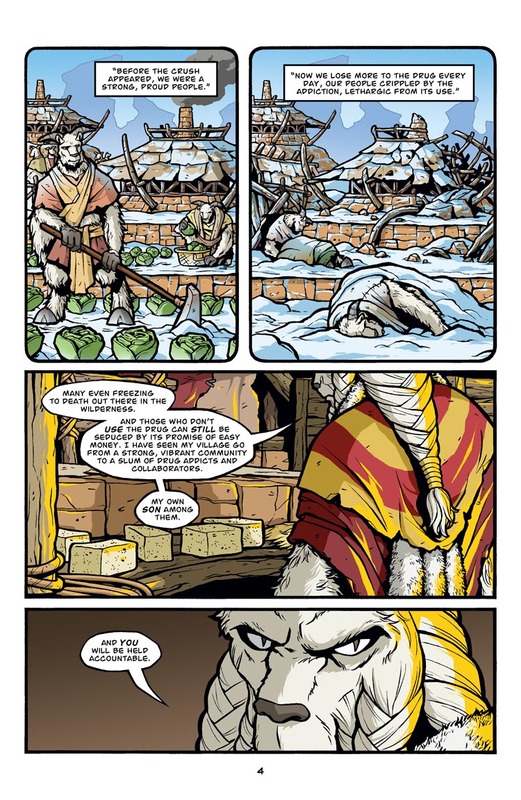 And for those paying attention, Goshen’s line finally explains that dead frozen goat alien at the very beginning of the story (The Big Snow Job #1, Pages 2-3). It’s a powerful cutaway and something that was probably needed to really hit home how his village was destroyed. Though I was wondering why the Kaagan-Vas would let them have any of the crush at first. Then it occurred to me that if you get them to help you and/or pacify/kill them, they become local labor or no longer a problem. Ah yes, the dead goat popped up in my head when Goshen told the story (he popped up, but he was still death though). Goshen also reveals a bit of Baso’s back story. I think the question is still open if the son is a addict, a collaborator or both. Of course Baso turning out to being Goshen’s son is now also possible. Speaking of things popping up. I wonder if you’ve done a good job of making most of the readers forget about it or if they are waiting in slilence. Ha ha! Yes, there is still another Ulon Dosi waiting to show her face. It will be happening very soon. Maybe. If only because there needs to be a cold weather girl for Miss December in the calendar. Will all the proceedings go to the Save The Root Beetle Foudation? Man… the villagers being reduced to addicts and drugrunners kinda sound similar to the ghettos in here America in some inner-cities. Did you grew up in there or at least had plenty of contact with it? I’m just wondering because I participate a lot in my church helping those people much as we can, so I see a lot of those people from the ‘hood’. Seems to me that you just wanted to ask an honest question. You just need to be carefull with some of your words, because whenever the term ‘those people’ is used it is bound to offend someone or any group of people. I don’t have any personal experience with addicts or drug running. I think the closest I’ve come was I was an extra in an episode of “Miami Vice” way back in the day. 🙂 Actually, now that I think about it, the episode title was “The Big Thaw” (it was about a cryogenically frozen reggae singer), which isn’t all that far off from “The Big Snow Job.” Weird. I guess now we can assume that Baso (http://runnersuniverse.com/2010/02/snow-job-ch-02-pg-20/) is his son. . .
All content copyright © 2001-2018 Sean Wang unless indicated. All rights reserved.